Fabulous photo of a lovely car received from Lora Devereaux (USA) inherited by her cousin from her mother. They are guessing the photo was taken in Minnesota where the family was from. 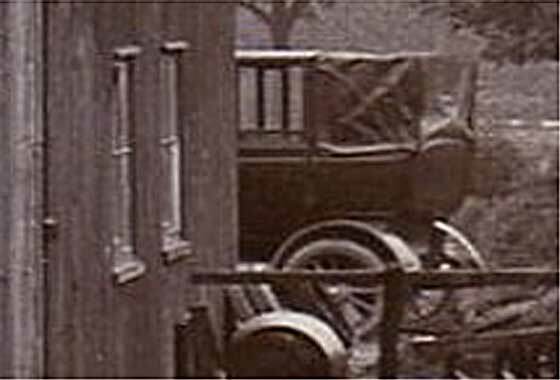 They are hoping the car can be identified, with the year, which will help narrow down who is in the photo. 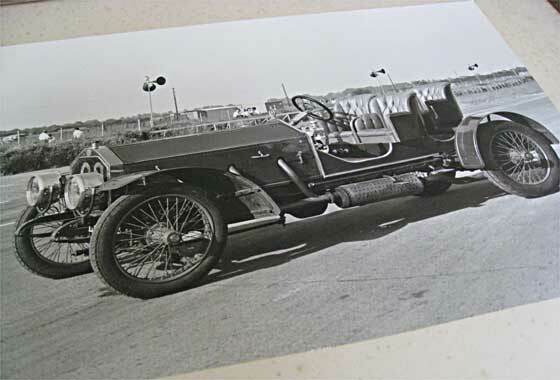 -- Really nice photo of a 1906 Pope Toledo Type XII which had 35-40HP four cylinder engine and which cost, according '06 Gas Auto Handbook, $3,700 with top. See earlier item on history of Toledo. Series of photographs received from Julian Stephens (UK) who is the Operations Director of the Lost Gardens of Heligan in Cornwall. This was the residence of the Tremayne family from 1600s until the 1970s. Gardens became overgrown. Is this a Renault? -- Same country, different make: Charron-Girardot-Voigt. 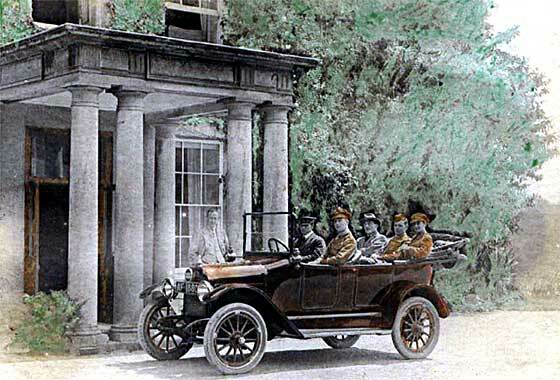 This is a cca 1905/6 CGV 25CV Side Entrance Tourer. Same reg as the Rolls on this page; probably had it first. Confirmed by our Bryan Goodman who had a quite similar 40HP. Photo of a photo received from Steve Walters (UK) asking what is it? -- One of our experts knew!! 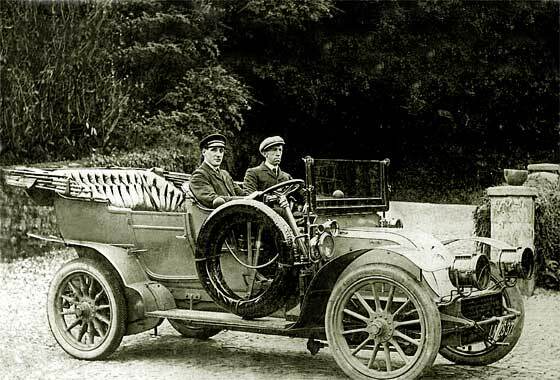 This is the 1907 Metallurgique-Maybach restored by the late Douglas Fitzpatrick; Metallurgique chassis fitted with a WWI Maybach 6-cylinder aero engine of 21 litres. Project started around WW1, abandoned at a large country estate and finished off by Fitzpatrick in the 1950s. It has been raced in VSCC meetings as recently as last year. Radiator maker's then badge featured star of David motif. We were contacted by Chris Reynolds (UK) of Hertfordshire Genealogy website which helps people with local and family history in Hertfordshire. 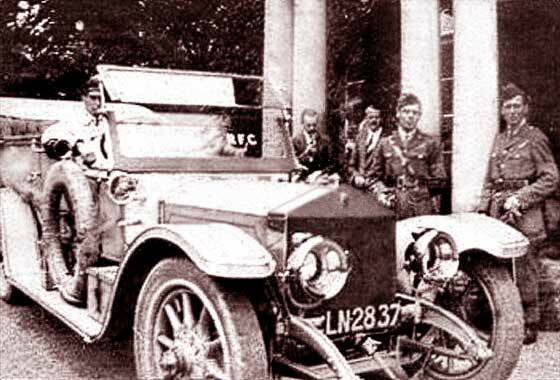 This photo taken August 1910 at Stagenhoe Park, shows student Dudley Tacon in a car that needs identification. -- CL434 is Norwich 1908. Our Bryan Goodman is the only one who came up with an answer on the car which was a 1908 GC Light Car with Sultan 8HP engine made by Automobiles G. C. , H. Guyot et Cie, Paris, - and only in 1908. Photo of a bonnet received from Jon Kennedy (Eire) which he found in his farm yard in Dublin. 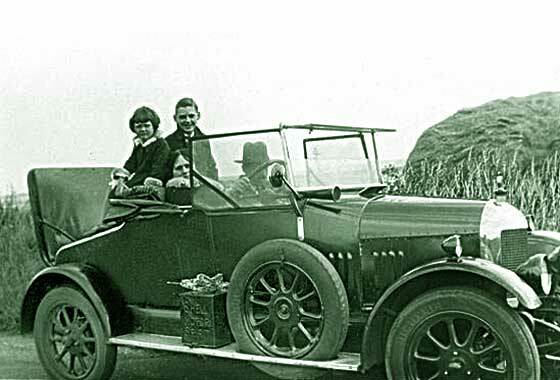 He searched and found a reasonable match on our website in a 1908 Swift Tourer but the numberplate is earlier? -- We agree that 1908/9 Swift is a likely match. IK266 reg is 2/3 years earlier than bonnet. No data is left on early Irish numbers and we have been advised by Irish enthusiasts that earlier authorities may have been lenient on unused or transferred numbers, as current data dates vary. Series of photographs received from Julian Stephens (UK) who is the Operations Director of the Lost Gardens of Heligan in Cornwall. This was the residence of the Tremayne family from 1600s until the 1970s. Gardens became overgrown and house eventually sold off as flats. -- Registration LN2837 is London CC1907 but the car is a 1910 Rolls Royce Silver Ghost chassis no 1243, engine no 43, sold by agent A B Wardman of London to Captain J. Tremayne of Cornwall, tested Feb 1910. Gone ! 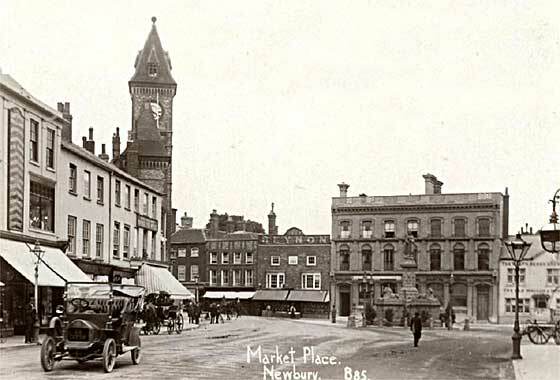 Lovely period photograph received from Patrick Evans from Newbury (UK) who is from this town and has recently returned to it. The photograph came from his old History teacher Mr Anderson and Patrick has been trying to find the approximate date. -- Registration AA #754 is Southampton County Council and ranges from 1903 to 1717. The first digit, which I cannot make out, would narrow it down accurately. Need a magnifying glass !! Horses are still about, - so is likely to be pre WW1. Series of photographs received from Julian Stephens (UK) who is the Operations Director of the Lost Gardens of Heligan in Cornwall. This was the residence of the Tremayne family from 1600s until the 1970s. Was Convalescent Home in WW1. Gardens became overgrown and house eventually sold off. -- Registration AF1850 is Cornwall early 1917. Ident is not positive as hand painting complicates, but a number of us agree that the car is an American cca 1916 White Touring, probably Model 45. Lovely photos received from Mario Majarich (Australia) who came with parents from the Dalmatian island of Losinj. His father was the first with a Taxi and trucks on the island. Not a family one, but what is the bus that was the first to do the route from Osor through to Veli Losinj? 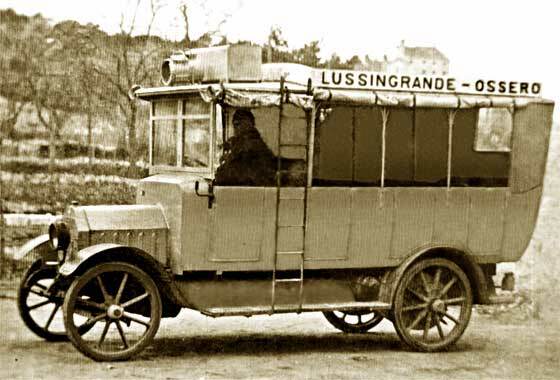 -- We are relatively sure from the spoked wheels, louvered bonnet and chain drive that this was a cca 1913 FIAT 18BL Bus. Produced 1915 to 1921 and used extensively in WW1 including British and French armies. Lovely photos received from Mario Majarich (Australia) who came with parents from the Dalmatian island of Losinj. 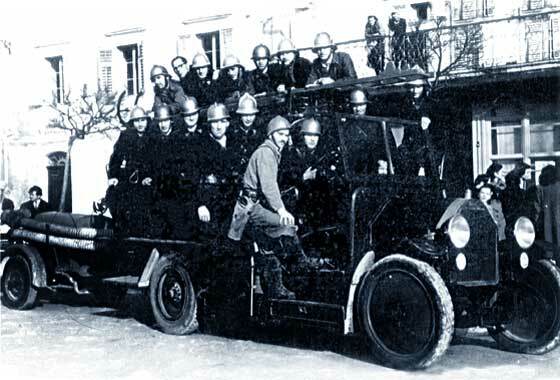 This Fire Engine was on Mali Losinj and was sent to him by one of his correspondents whose uncle is at the wheel. 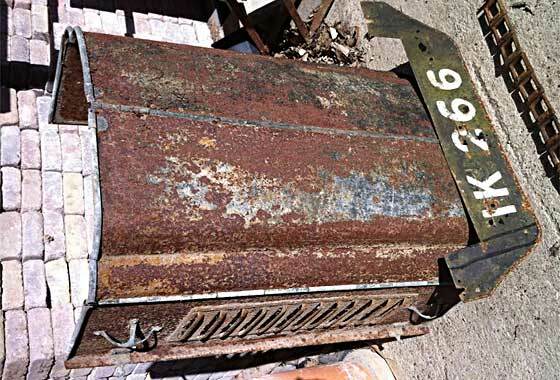 Taken in 1952 of a vehicle abandoned for a number of years and eventually restored. Is it a Lancia? -- No, this is a cca 1919 15TER Fire Engine. 15TER lorries were made 1911 to 1920 and widely used until the 1940s. Lights and rear wheels were later, probably 1920s. Lovely photos received from Mario Majarich (Australia) who came with parents from the Dalmatian island of Losinj. His father was the first with a Taxi and trucks on the island. 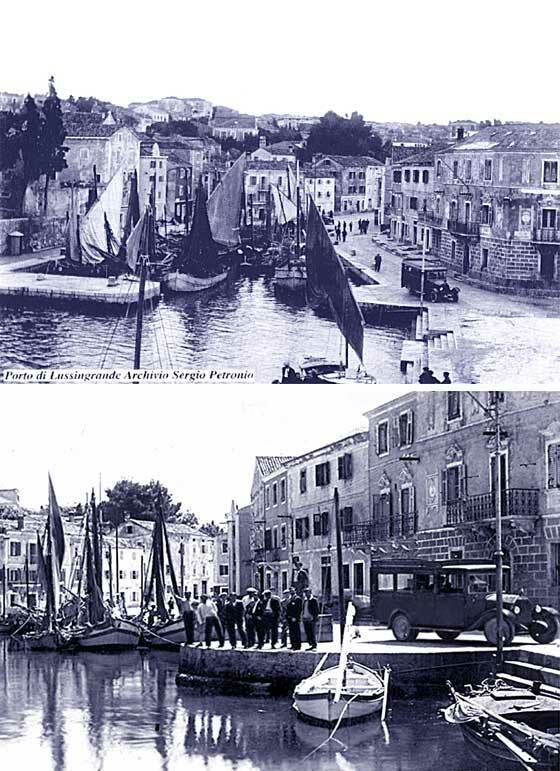 These postcards show the harbour of Veli Losinj. Not a family one, but what is the bus? -- This indeed is a Lancia. Lancia chassis were frequently used for the manufacture of busses and charabancs. Many even made their way to the UK and were popular. This looks like a cca 1921 Lancia Kappa Bus in lovely scenery. 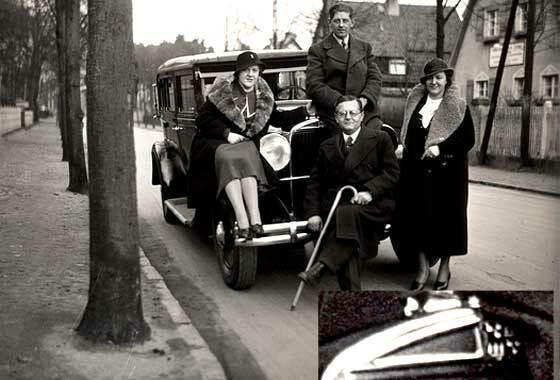 We were contacted by Chris Reynolds (UK) of Hertfordshire Genealogy website which helps people with local and family history in Hertfordshire and has a page which helps dating old photographs by the cars in them. This photo shows Colliers End and perhaps a Bullnose Morris. -- Sorry wrong country. Likely built in the UK but car is French. Essex CC registered, this is a 1925 Citroen 5CV Model C , as RHD, probably built in Slough, Bucks. Difficult to tell if it is a Tourer or a Trefle, not Cabriolet. 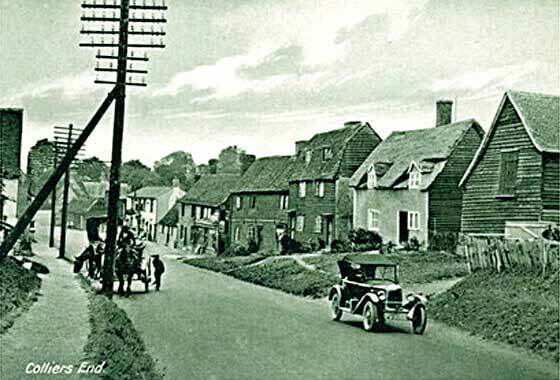 We were contacted by Chris Reynolds (UK) of Hertfordshire Genealogy website which helps people with local and family history in Hertfordshire and has a page which helps dating old photographs by the cars in them. 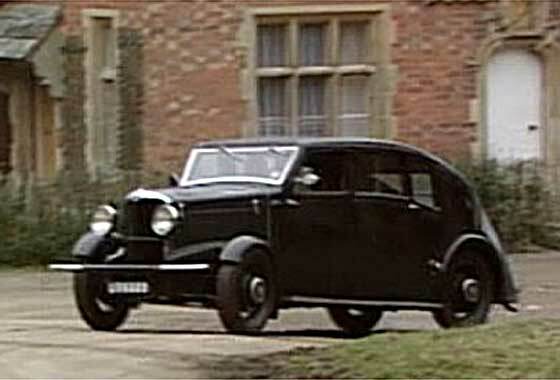 This one has a badge that is unrecognisable but could be a Bullnose Morris. -- Bullnose Morris indeed, Registered in Hertfordshire early 1925. Our Chas Moody advises small radiator, no front wheel brakes, flat sided rear bodywork : 1925 Morris Cowley Two-Seater with Dickey. Another photo received from Raoul Rainer from Stuttgart (Germany) from a batch of 1920s/30s photos he purchased on-line recently. The car looks slightly American. The badge on the radiator vaguely resembles the Cadillac crest. Do we have any idea what it could be? -- Absolutely not, and nor could anybody else. Srange radiator/badge. Not until Pepcak from Prague cracked it by saying it is a cca 1929 Audi Type SS Zwickau Pullman saloon, with bankrupt Rickenbacker engines. Another photo received from Raoul Rainer from Stuttgart (Germany) from a batch of 1920s/30s photos he purchased on-line recently. The car looks slightly American. Location is Grossglockner High Alpine Road in the Austrian Alps. -- Another difficult one which took absolutely ages to crack but finally we have it: Czech cca1930 Skoda 430 Saloon. Powered by a 4 cylinder 30HP 1331 cc engine, five body styles, 3028 made between 1929 and 1932. 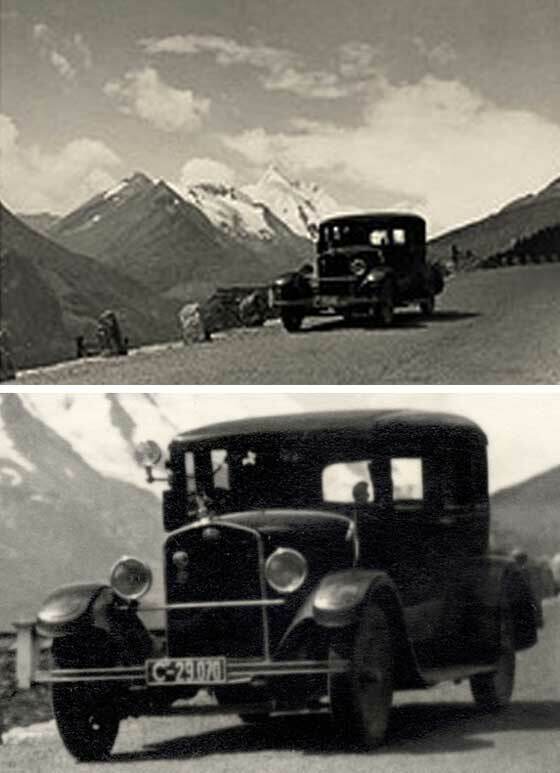 Licence plate is Czech, Bohemia 1932+. Lovely photos received from Mario Majarich (Australia) who came with parents from the Dalmatian island of Losinj. His father was the first with a Taxi and trucks on the island. Mario thought this was a 1913 Lancia. 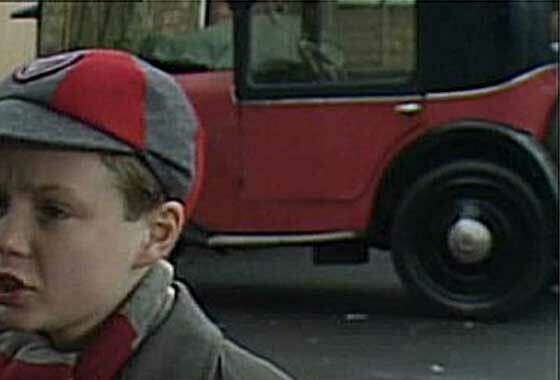 His father also had a Mercedes Benz lorry in WW2. -- Not 1913 and relatively sure not a Lancia. 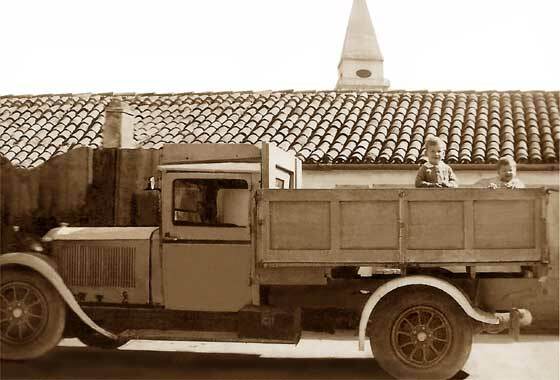 Took a lot of searching but we are now relatively sure this is a cca 1930 Mercedes Benz L1000 Delivery Truck. War came along very few years later so was likely used during the war. Interesting cinema screen grab of a vehicle which appeared in a British BBC Mini Series "Box of Delights" made in 1987, where the vehicles are being investigated by IMCDB. Based on the children's book set in 1934 about an artifact dating from pagan times that allows the holder to manipulate time and space. -- As it seems to have the wrong wheels, a cca 1930 Rosengart LR2 Faux Cabriolet made in France under licence from Austin UK as 7. Otherwise special bodied Austin 7 of same period. Another Photo received from Job van Huizen (Holland) asking if the SVVS could help him identify this car. He took the photo in the North of France but has not been able to identify the year and model. 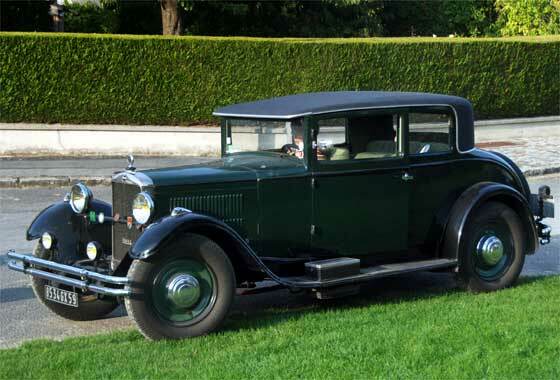 -- From the two rows of bonnet cooling louvers this seems to be a cca 1931/2 11CV Unic Coupe. There was a larger 8 cylinder 15CV car with a similar layout but this had a figure 8 under the Unic logo on the radiator core. Coachwork maker's plate is on the bulkhead just forward of the door. Another photo sent in by Lindsay Crawford (Australia) this time of a motorcycle that is quite unusual. No info on the people but the photo was taken in about 1936. 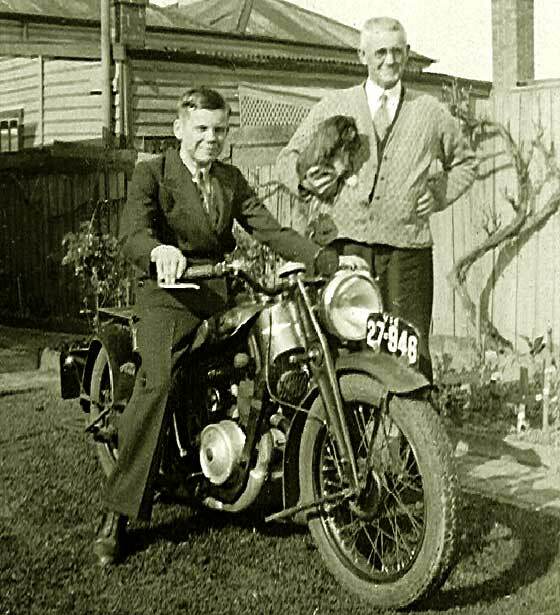 -- During the early 1930s a number of motorcycle manufacturers in a number of European countries used pressed steel frames rather than tubular frames. This included BMW, Zundapp and Russians. This one however is British, one of the first, being a cca 1933 Coventry Eagle 250cc Silent Superb due good silencing. Another smashing photo sent in by Lindsay Crawford (Australia) this time of a motorcycle. 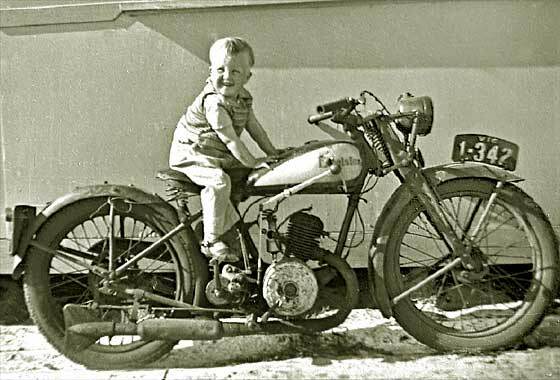 He does not remember this one, but does recall Dad talking about his 'BSA' - which may have been this one, photo taken in August 1942. 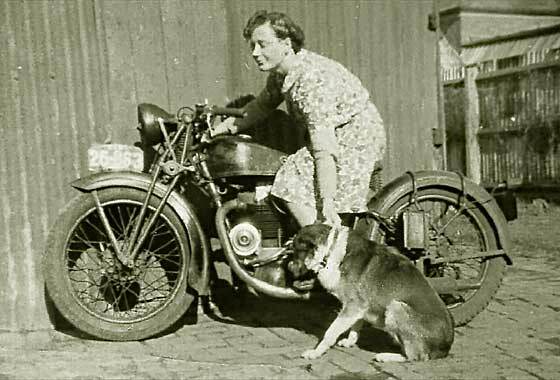 -- No info on the lady or the reluctant dog, but we can say it is not a BSA. Our Chas Moody has identified that it is a Sunbeam. Exhaust and chain seem to be on the 'wrong sides' which narrows it down to a cca 1934 Sunbeam 95L, a fast OHV single cylinder. Fuzzy photo received from Ron Pratt (USA) taken in Greensburg, Pennsylvania. 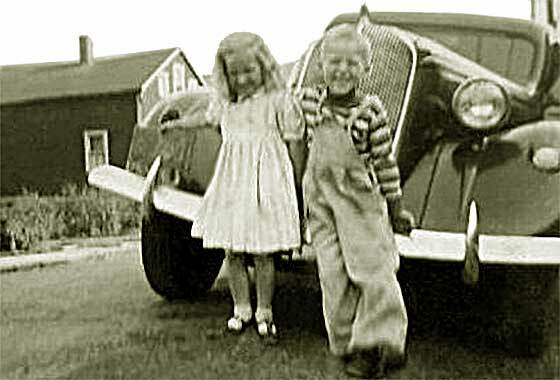 That is him on the right when he was 5 years old, and the girl is his cousin. The car was owned by his Grandfather who lived in Adamsburg. 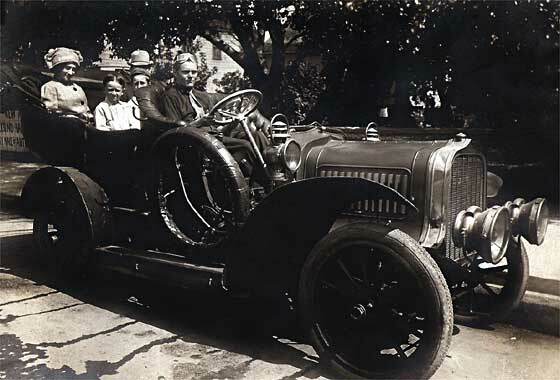 When he passed away in 1948, the auto was passed on to his father. -- The pointers to this one are the waterfall grille to the top, headlamp mounted on mudguard, the pointed bumper overriders, and most importantly, sidelights low on the wing and molding below light. Another photo sent in by Lindsay Crawford (Australia) this time of a motorcycle somewhat more battered. Picture shows him on it and he can make out 'Excelsior' on the tank. This photo was taken in 1948. -- Battered indeed as bike is about 11 years old by then. From the position of the carb, hand gear change and pressed steel type of forks, this is a cca 1937 Excelsior Pioneer 150cc Motorcycle. Similar 'Empire' model had twin exhausts which cannot be seen on this photo so unlikely to be. Series of photographs received from Julian Stephens (UK) who is the Operations Director of the Lost Gardens of Heligan in Cornwall. This was the residence of the Tremayne family and convalescent home WW1. -- Such a very poor series of photos that none of our experts were even prepared to go out on a limb and take a guess. Registration AF11## is Cornwall CC 1914. Bonnet has some resemblance of Lorraine Dietrich but rad badge is of the type on Fiat/Peugeot/Vinot. Seems chain drive. Photograph received from Chris Pownall (UK) who is publishing a book shortly which contains the photo of rear end of a car. -- Regretfully ident is not possible because all the important features are hidden. 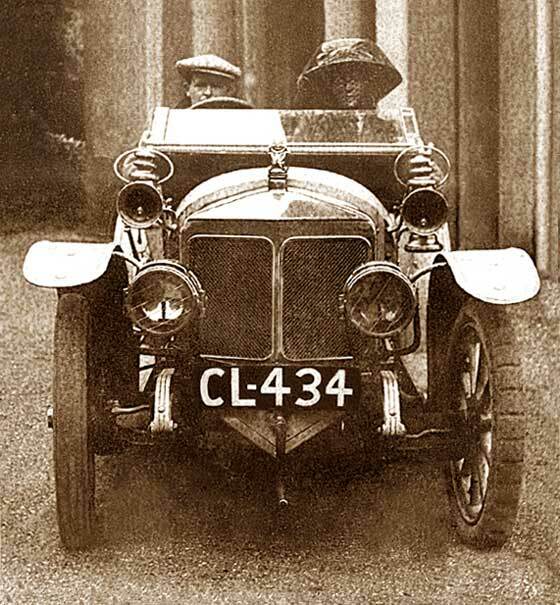 Not normally possible to tell early cars by bodywork as made by external coachwork companies. Body is a Landaulette with a relatively crinkly roof suggesting an early hood from about 1900 to 1914 (cca WW1). After this the hoods would have been much tauter and crinkle-free.